An edited version of this diary was first published on ESPN cricinfo. Day 93: Aboard Jet Airways flight from Mumbai to Dubai. Seeing the Business class cabin empty, make a joke to the airhostess that she should just let us sit there. She says, “People are coming”. Sure enough, people do come to take those seats. There is a big hubbub in the plane and people are rushing from the economy section to the front to take pictures. Blast from the past: Bollywood couple Ajay Devgn and Kajol! Stay in the Al-Karama area of Dubai with the father of Bharathram, who’s been transcribing the Couch Talk podcasts, for the last 2+ years. The area is a lot like India. There is even a South Indian restaurant around the corner; We take full advantage of the proximity. Day 96: Take a taxi to watch the last day action of Australia tour match against Pakistan A at the Sharjah Cricket Stadium before the Test series begins. My last memories of living in India and watching cricket on TV are of Sachin Tendulkar’s “desert storm” innings. So the short visit to the stadium feels a bit like a pilgrimage. There are still hoardings and advertisement in the stadium from when IPL 2014 was held many months earlier. Notice a quiet kid of about 12 years filming the match on his handheld camcorder. Chat him up. He is of Indian origin and is a leg spinner. Plays his cricket at a local cricket academy. Tell us his parents drop him off in the morning and pick him up at close of play, every day. Dedication. 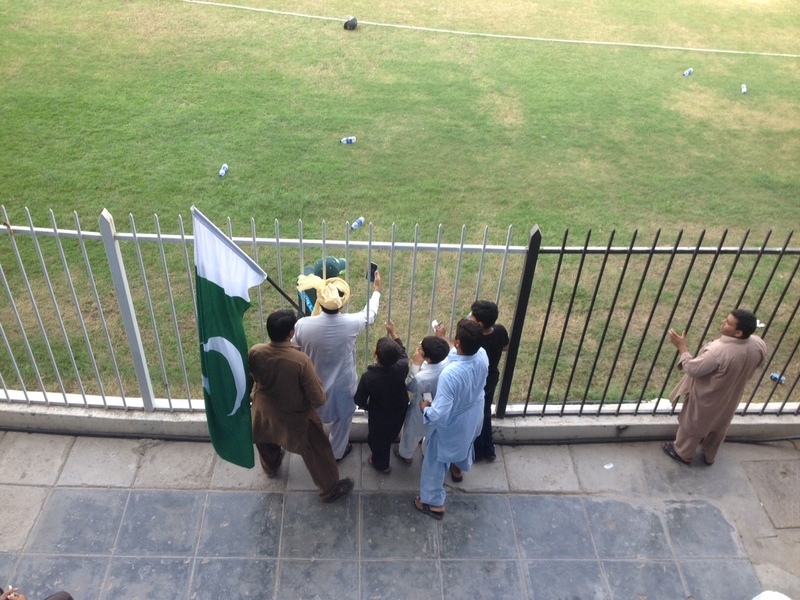 Some 100 vocal Pakistani fans make their presence felt. 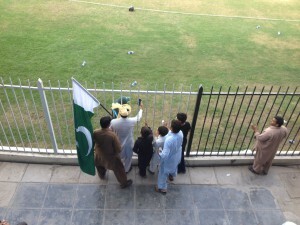 The Pakistani superfan “T20 Chacha” leads the chants of “Pakistan Zindabad” as Pakistan A beat Australia easily. Chacha gets a selfie taken with Greg Blewett – who’s with the Australian team, and then asks him his name. Seen that happen to Blewett in 2007 in Antigua too! Day 98: Pick up press pass at the Dubai International Cricket Stadium. Beautiful arena with plush facilities, but so far away from the city centre. Need to take the Dubai Metro and then a bus to get there. Michael Clarke addresses the Australian journalists. He’s still in his pads, straight out of a nets session. He seems a bit ticked off with one of the journalists about a recent piece questioning his form. Lets them know that “respect has to go both ways” and since they “will be seeing each other a lot over the next 12 months”, he wants to lay down some ground rules. Rent a car abroad for the first time, and drive to Al Ain zoo. Lions, Tigers, Giraffes, Zebras, Gorillas – animals far from their natural habitats. Seems like the story of Dubai – a modern, glitzy city in the middle of a soul-sucking desert. The idea that Dubai Mall has an indoor ski resort just goes with that. Day 99: Pre-series pressers with the captains. Two very different captains. Clarke makes eye contact with the person he’s responding to. Misbah has an emotionless stare transfixed on a spot faraway. Both very professional in handling the press. Trying to go ICC Global Cricket Academy to meet former Pakistan opener Mudassar “Mudi Pa” Nazar, who’s the coach there. 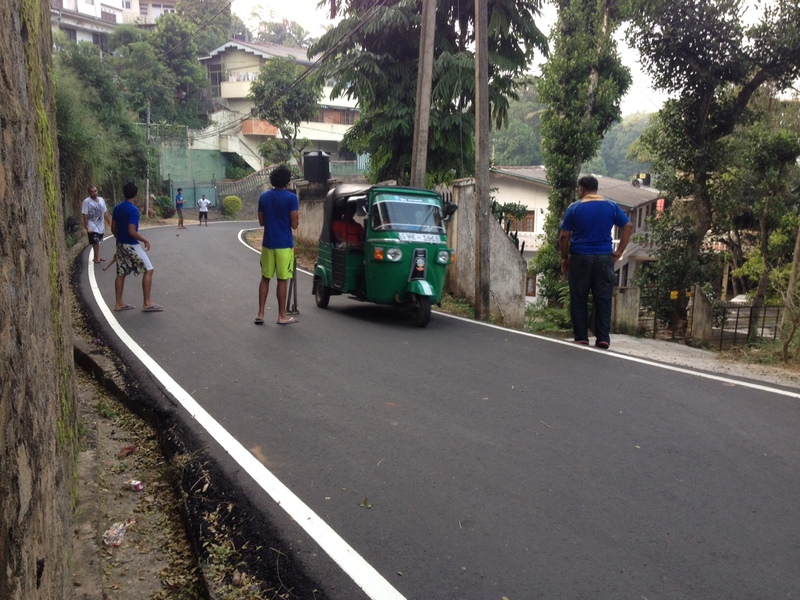 A car stops to drop off Clarke and James Faulkner. They ask me the way to the dressing rooms. I respond with “F**k knows! I am as new here as you are.” They laugh and walk off, trying the various doors. Ask the gentleman who dropped off the players for directions to the Academy. He offers to drive me there. Turns out he was just a fan who’d come to see the players at training, and not some officially appointed person. Love. Meet Mudi Pa at the Academy. He walks around wearing casual t-shirt, shorts and flip flops. Some of my earliest cricketing memories involve his mammoth innings against India. Set up a time for the podcast. Day 100: First day of Dubai Test. On the bus to the ground, meet a couple from Yorkshire, Ian and Sue Jones. They have been traveling every English winter for the last 15-odd years to warmer climes, and follow cricket. Devotion. Day 101. Interview Mudi Pa over Skype. Realize quickly that Skype-to-Phone is not allowed in U.A.E. for whatever reason. Internet helps in identifying a reliable VPN service that re-routes the call through another country, which allows Skype-to-Phone to work. The things you learn on a world trip! Comes in handy later on in India as well! Day 104. Australia takes the Test to the final session threatening to draw the match but lose. It could have been one of those blockbuster nerve-wracking draws that really makes Test cricket what it is, and also given me bragging rights to say, “I was there”, but alas, it wasn’t to be. Clarke comes to the presser and soaks up the blame, while happily giving credit to Younus Khan and Pakistan. He was there for the earlier days when Australia didn’t do well, too. My respect for him goes up a bit, as he is ready to cop it for the team, unlike some teams that send out assistant coaches to the pressers on bad days. Day 105. Attend a media interaction at the ICC Headquarters. Presentation on DRS and the upcoming World Cup. Q&A with ICC Chief Executive David Richardson. Not happy with the responses and explanations I get for my questions on DRS. Request Richardson to be on Couch Talk; says ‘may be’. We get a tour of the building. Get to see the new office of N. Srinivasan. Day 106. Taxi from Dubai to Abu Dhabi. Stay with Osman Samiuddin of The National and Cricinfo/Cricket Monthly. Day 107. Pre-match presser day. Wait on the ground for three hours for Australia to finish training to interview their Assistant Coach Craig McDermott. Conduct the interview by the sight screen even as the nets session was winding down. Steve Smith is nailing them in practice. You can hear it in the background. The normally subdued Chris Rogers hits one out of the park and the team hollers and whoops it up. See a lot of Phil Hughes, running around taking part in drills and just trying to keep the mood up in the group after the 221 run-defeat in Dubai. Little did I know that will be the last I ever see of him. Day 108. First day of 2nd Test in Abu Dhabi. Another Younus Khan 100. Clarke fronts up to the press again. Get delayed by work in the press box and Abu Dhabi traffic. Rush to airport to catch flight to Sri Lanka. Day 109. Land in Sri Lanka. Felt cranky by the red-eye flight and the annoying cellphone and foreign exchange hawkers at the airport. Glad to be on the taxi finally to nod off on the way to the residence of Cricinfo’s Andrew Fernando in Colombo’s suburbs. The directions are hard but eventually we get there. It is the monsoon season in Sri Lanka and one could feel it in the humidity. Day 112. Take the train down the picturesque south-west coast to Galle, and take up a place at the Galle Fort. Walk to the Galle Stadium, which still has a lot of banners of Mahela Jayawardene from his last Test in Sri Lanka. There were kids in whites playing a schools game. Plenty of spin bowling but the match is cut short by rain. Story of the trip. There was no international cricket in Sri Lanka at that time but the West Indies High Performance Center team was visiting but the matches I was planning on watching get washed out. Days 114-115.Take a 7 hour bus ride from Galle via Hambantota to Tissemaharama to do a safari at Yala national park. Since Leopards are the apex predators there, it is the best place on the planet to spot leopards in the wild. 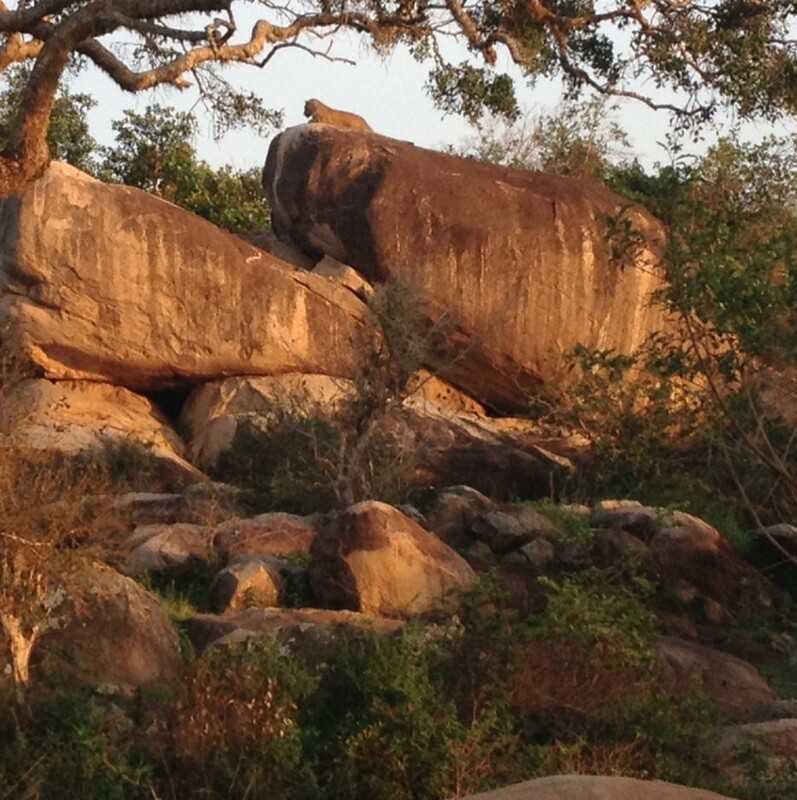 An hour in to our safari, we see one resting on top of a rocky outcrop warming up in the morning sun. We see a couple more later on. 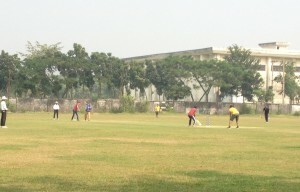 On our way back, we notice kids playing cricket just beyond the boundaries of the park. Brave souls! Day 117. Back in Colombo, visit the Cricket club café. All the items have a cricketer’s name associated with it. Funniest of them all was “Ian Botham’s Banana Split”. The restaurant has cricket memorabilia from all over the world, displayed country-wise. You can tell from the fact that there is a Bradman Bar, at the center of the restaurant, cricket-mad Australians set it up. Day 118. Train to Kandy. Relief from the heat of Colombo as the train slowly chugged its way up the mist-covered mountains. Stay near Trinity college, Kumar Sangakkara’s alma mater. The host we are staying with is a school senior to Sanga. 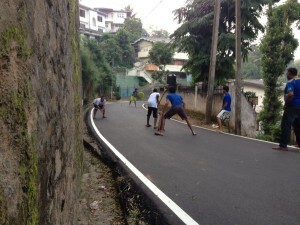 Spot a game of street cricket on the hillside and join it for a little bit. The kids are playing “Test cricket”. Each batsman gets to bat as long as he wants till he gets out. Hitting directly in to any of the neighboring house is “out” in addition to the normal ways of getting out. Day 122. Almost missed the early morning flight to Bangladesh. Overslept. Woke up with just 3 hours before flight. Packed, took taxi. Reached in time. Fell asleep at friend’s place in Gulshan, Dhaka. Woke up to Rohit Sharma’s 264 on the Telly. Take overnight bus to Chittagong. Day 123. Day 3 of the third Test between Bangladesh and Zimbabwe. First session in the stands but BCB media liaison invites us to be in the press box. Watch the remainder of the Test from there. Day 124. The match is a grind. The talk in the press box turns to – of all things – Indian movie star Rajnikanth. People are playing the clip from the Hindi movie “Giraftaar” of Rajinikanth flipping a cigarette. Day 126. 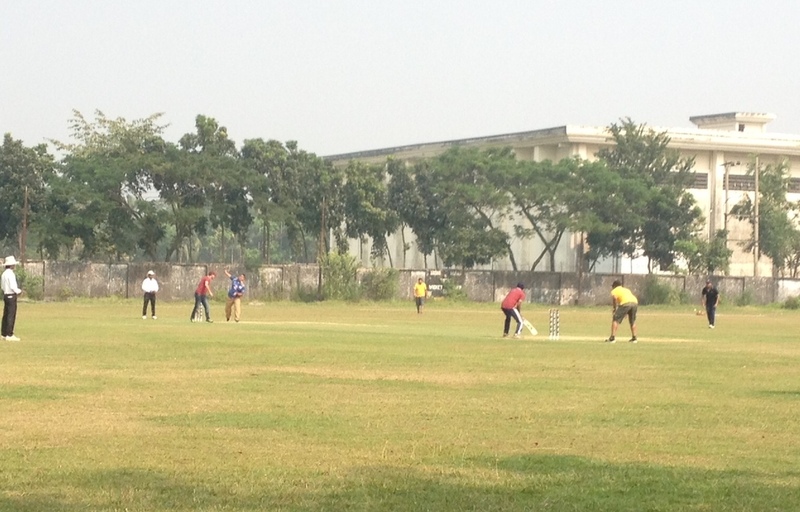 Stay an extra day in Chittagong to take part in the Media cricket tournament. Get to open the bowling for the “Journalists” team with a taped tennis ball. Three-over spell. Two catches dropped of my bowling. Cricinfo’s Mohammad Isam takes three wickets with his left arm orthodox spin. Overnight bus back to Dhaka. Day 128. Aboard Jet Airways flight from Dhaka to Mumbai. It’s the same airhostess from our Mumbai to Dubai flight. She recognizes us as well, and gives us extra beers. Good times! 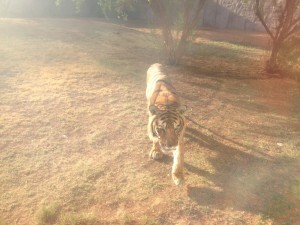 This entry was posted in Featured, Miscellaneous and tagged Bangladesh, Sri Lanka, UAE, World Trip. Bookmark the permalink.